The ID. 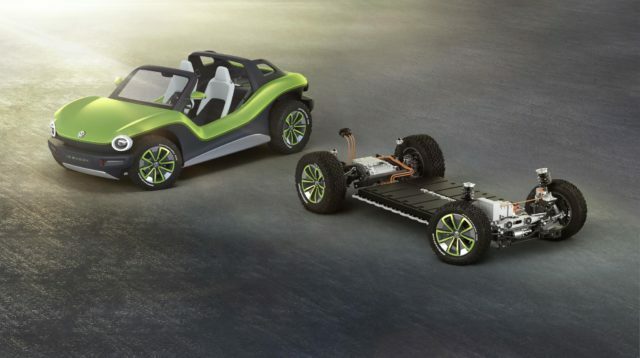 Buggy is still only a concept for now but displays the versatility of its underpinning MEB platform – the scalable electric car tech that will underpin all of Volkswagen’s next-generation of EVs. The Buggy is a clear look back to the classic dune buggies of 1960s California – based on the VW Beetle and its versatile, rear-engined chassis. In keeping with the dune buggy theme, the ID. Buggy offers an open body that does without roof or doors, as well as chunky off-road tyres and wide wheelarches. In keeping with the original models, the ID. Buggy is rear-wheel drive thanks to a rear-mounted, 202bhp electric motor. Top speed will be just shy of 100mph and 0-60mph will be despatched in around seven seconds. Volkswagen claims a range of around 155 miles from the 62kWh battery. 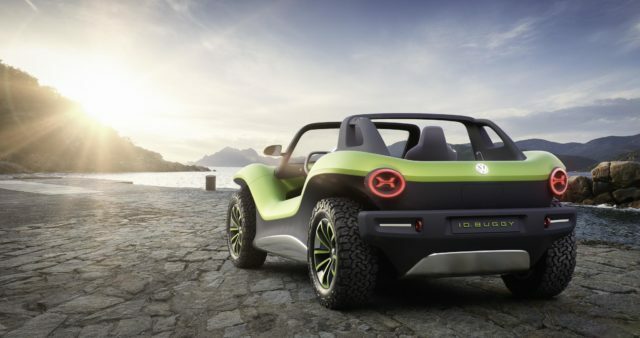 The Buggy’s minimalist bodywork – painted in two-tone green and grey on the show model – includes a minimalist and weatherproof interior, but Volkswagen claims the real appeal is its modularity. As the chassis is self-contained, the bodywork can be removed altogether, opening up possibilities of other companies providing their own models on the same platform. Volkswagen has already stated it wants to make its MEB tech available for other manufacturers to use. There’s no confirmed production date for the ID. Buggy yet – Volkswagen is likely to wait until more mainstream ID. models have proven successful before it invests in cars such as this.